A popular topic in the wellness world, but is it a healthy choice? Background What Is Water Fasting? Water fasting is popular in the wellness world, but you should approach it with caution. While it may help you lose weight in the short-term, it’s not a sustainable approach to health or weight loss, and it puts you at risk for health complications. Fasting is nothing new. It’s been an integral part of many religious communities for centuries, and fasting diets have been popular since the early 1900s. One of the most popular liquid diets, the Master Cleanse, was created in the 1940s by Stanley Burrough, a self-taught alternative medicine practitioner. Long before fasting became popular for health or fitness reasons, fasting was (and still is) practiced for religious or spiritual reasons. Fasting rituals such as Ramadan—the month-long tradition in the Muslim community that entails strict fasting from sunrise to sunset—serve as periods of spiritual renewal and reflection for participants. People and companies who promote fasting often use the religious example as an explanation as to why extended fasting is healthy and acceptable. Another common argument is that our paleolithic ancestors went for long periods of time without access to food, so we should also be able to. However, many paleo proponents forget that times are vastly different and there’s no easy way to compare the eating habits of now to then. Today, there are many different detox diets that promise to cleanse the body of toxins, promote weight loss, and improve health. Most detox diets aren’t grounded in science—rather, many people decide to fast or detox because of the apparent success stories from others. There are several potential benefits to water fasting, but keep in mind that the science on water fasting in humans is limited. The potential risks may outweigh the benefits. A water fast is true to its name: it's a fast during which everything except water is restricted. That means no coffee, no tea, no zero-calorie sports drinks, or any other beverage. This also means no food. Water fasts typically last 24 to 72 hours. For your safety, you should not try to fast for longer than three days without medical clearance and supervision. Many popular cleanses are modeled after water fasting, such as the lemon detox cleanse, during which you drink a water-based concoction for up to 40 days. Most people embark on a water fast or similar regimen for its purported health benefits. Water fasting is simple, but that doesn’t mean it’s easy. During a water fast, you can’t consume anything but water. If you decide to water fast, it’s recommended that you drink at least two liters of water per day, but ideally, three liters because you will not get the water you normally get from food. If you’ve never done a water fast before, you might want to prepare your body by gradually decreasing your calorie consumption for a few days leading up to your fast. If you do engage in a water fast, try to resist the urge to eat a big meal. After restricting yourself from calories for an extended period of time, consuming large amounts of food can cause digestive discomfort or nausea. At worst (though it’s unlikely), you are at risk for refeeding syndrome, a potentially fatal condition that involves rapid metabolic changes, usually in people who are extremely malnourished. Instead, start by adding caloric beverages like milk or juice, and work your way up using snacks and small meals. By the third day post-fast, you should be able to eat normally again. There are promising potential benefits of water fasting, but it’s important to note that there is no substantial research on this topic: most of the studies on water fasting were conducted on animals, and the ones that have been conducted in humans are limited. This is true, if only for a few days. By restricting caloric intake for 24 hours or more, you will more than likely experience weight loss. Remember though, that this weight loss is probably in the form of water weight and glycogen (stored carbohydrates), and not actual fat loss. It takes a few days for your body to begin burning stored fat because it uses available energy like glucose and glycogen first. Drinking more water and consuming less salt are two things associated with lower blood pressure readings. A water fast will enable you to do both of these things, which could help manage blood pressure. Medically supervised water fasts have shown to be effective in lowering blood pressure in patients with borderline hypertension. However, these patients fasted for an average of nearly two weeks—much longer than the recommended 72-hour maximum water fast. It’s unlikely that a one-to-three-day fast would create the same effect. Every day, your cells are broken down and recycled. This process is called autophagy, and it’s thought that autophagy may play a role in preventing cancer, heart disease, and Alzheimer’s disease. Research on water fasting in animals suggests that water fasts promote autophagy. There is little science on the relationship between water fasting and autophagy in humans, however, so we can’t say for sure that this is true. There is limited evidence that water fasting can help with cancer and heart disease. One study enrolled 30 apparently healthy volunteers into a 24-hour water fast. At the end of the fast, the participants showed lower levels of triglycerides and cholesterol, two big risk factors for cardiovascular disease. Some animal studies (mainly conducted in rats) show that water fasting can protect the animals from free radical damage to the heart. Additionally, research on animal suggests that water fasting can stop the growth of tumors, as well as improve how well an animal takes chemotherapy. Research shows that fasting of any type may help to improve insulin sensitivity. Insulin resistance is the main factor in the development of type 2 diabetes, so it’s possible that short water fasts can improve insulin sensitivity and decrease the risk of diabetes. There are several potential benefits to water fasting, but the science is inconclusive and does not position water fasts as healthful in humans. Any fasting protocol can put you at risk for nutrient deficiencies. By restricting calories, you are also restricting essential vitamins, minerals, fatty acids, amino acids, and electrolytes—all things your body needs to function properly. Even though you drink water during a water fast, you can be at risk for dehydration. For most people, at least 20 percent of daily water consumption comes from the foods you eat. If you don’t increase your water intake during the fast, you will actually end up consuming much less water than usual. On the other hand, if you drink too much water, you may experience hypotension. Hypotension is extremely low blood pressure—the opposite of hypertension, or high blood pressure. Additionally, you may experience orthostatic hypotension, which involves sudden drops in blood pressure upon standing up. Orthostatic hypotension can cause dizziness and lightheadedness. Also called water intoxication, hyponatremia occurs when the water and salt lost through sweating are replaced by water only. You shouldn’t exercise during a water fast because you will lose salt through perspiration and won’t be able to replace it by eating food or drinking sports beverages. Dizziness, fatigue, and brain fog are all symptoms of extreme calorie restriction. When you don’t consume the number of calories your body needs, your body will struggle to perform at an optimal level. It may become difficult to focus at work or school during a water fast. Fasting can also cause mild-to-severe headaches. Fasting—and dieting or restricting calories in general—often leads to binge eating. Fasting can also lead to obsessive or intrusive thoughts about food, which may cause you to binge eat when your water fast is over. At worst, recurrent fasting or extreme restriction of calories can lead to the development of disordered eating or an eating disorder. Eating disorders—fasting may lead to disordered eating patterns like a binge-restrict cycle. 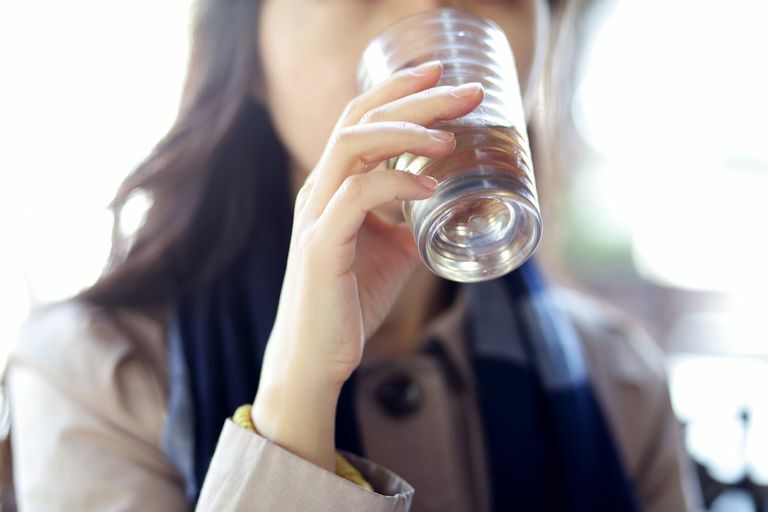 Water fasting presents several risks that outweigh potential benefits, and people with certain medical conditions should not attempt to water fast. While water fasting may help you lose a few pounds, chances are those pounds are mainly water and glycogen (stored carbohydrates). It takes several days for the body to begin burning body fat. There are many different types of fasting that may be more beneficial and help you lose more weight sustainably, such as intermittent fasting or alternate-day fasting. There are also many ways to safely lose water weight and a number of yummy cleansing foods that can help flush your body of toxins if that is what you're looking to do. If you do decide to try a water fast, you should be clear on the risks and stop the fast if you feel sick, overly fatigued, dizzy, or emotionally stressed about the fast.